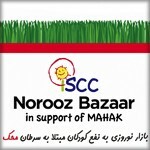 Please join ISCC in celebrating the arrival of Persian New Year by attending our Nowruz Bazaar supporting underprivileged children suffering from cancer. The Nowruz Bazaar features a variety of delicious homemade torshis, jams, pastries, haft-seen items and entertainment for children and adults. The attendees are welcomed by a beautiful haft-seen arrangement and a room full of enthusiastic volunteers selling different items. Children are entertained by Haji Firooz and Amoo Norooz, face painting, and arts and crafts, such as haft-seen making and egg decorations. The attendees and their children are encouraged to bring back their filled piggy banks (Ghollaks) and receive their Nowruz Eidi. Hassan was an energetic child who was always on the go. But just before Norooz of 2013, his parents noticed their little boy was sleeping more and didn’t want to eat or play. When his skin took on a yellowish cast, his parents took him to the local Infirmary Health care unit at Tonekabon, Mazandaran. His mother initially thought the symptoms might be related to the molded basement apartment they lived in. Blood work revealed the crushing news. Hassan suffered from acute lymphoblastic leukemia, the most common form of childhood cancer. “I kept saying ‘no, no, no.’ it was devastating,” Hassan’s mom remembered. His family was referred to MAHAK hospital for his treatment and care. Hassan immediately began chemotherapy at the hospital and his mom was relocated at the MAHAK dormitories. Today Hassan is back in Tonekabon attending school and visits MAHAK quarterly for follow up visits. To help give hope and make a difference in the lives of children like Leila, please become a partner with ISCC and join us as a monthly member.